Many companies find themselves in this situation: you noticed your company was being held back by an outdated system. With paperwork piling up and constant process delays, you decided to take action. After some extensive research, you decided that an ERP was the solution to streamlining your company’s daily activities. 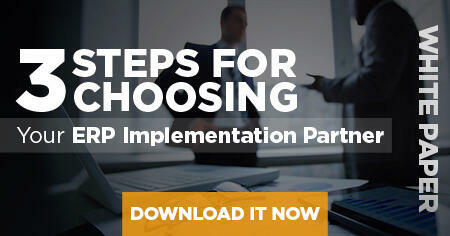 Unfortunately, you chose the wrong partner for your ERP implementation, and things started to fall apart. Don’t worry, you’re not alone. Luckily for you, there are steps you can take to fix this. When we go in for a project rescue, the first thing we do is analyze why exactly an implementation failed. We’ve said it before, and we’ll say it again: implementations need an expert. We’ve seen it time and time again where companies choose partners that don’t have enough experience or a dedicated team. Bad partners can end up derailing a project, causing the process to take twice as long as it’s supposed to, costs to skyrocket, and leaving the team hiding in a corner, in a state of mental despair. A good implementation partner can rescue you from this catastrophe and put you back on track. The most common scenario that our team encounters during the assessment stage is that the legacy data has not been correctly migrated. Most implementation partners presume that their client will do it themselves, but the process can be very complex and requires an expert’s touch. If done correctly, it can represent 50% of all the work required for implementation. That’s a large amount of work to be overlooked! Another common reason for a failed implementation is insufficient training for new ERP users. Even if the implementation was successful, without proper training, companies are unable to collaborate and use the software properly. A good implementation partner will leave your team with the knowledge they need to succeed. They should help your team acclimate to their new ERP functionalities and applications and offer additional customizations to ensure a streamlined integration into the company. Finally, there are many technical aspects to an implementation that may go wrong but aren’t as easy to point out. These technical complications are not as common and usually very specific to the implementation itself, which means they require a thorough assessment. The key is to find a knowledgeable implementation partner that can perform a thorough assessment and discover any hidden problems. If you’ve faced any of the mistakes stated above, or even all of them, just know that there’s still hope for you. That’s why we call it a rescue! You can definitely get your company back on track, you just need to be careful about the next few steps you take in saving your implementation. Don’t panic – you’re not the first business that’s gone through a bad implementation, and it’s not an irreversible problem. So, don’t let the panic affect your team’s good work. Contact a partner that has experience with project rescues as soon as possible! They will take an in-depth look at your implementation to assess what might have went wrong, or if you even need a project rescue. Now that you’ve taken time to breathe, it’s time to move on to the real rescue. When our team takes on a rescue project, we make it our mission to find each and every cause for any possible malfunctions in your implementation. Some call us heroes, but we don’t do it for the fame – we do it for you. We begin with a review of your company’s existing documentation. This should provide us with knowledge of what was done during your implementation and provide an idea of what was done right, what is salvageable, and what needs to be redone. We don’t want to throw away months of work if we don’t have to. We just want to give you the best possible service that will get your back-office processes running smoothly. Next step is a health check assessment, where we check if the implementation was properly aligned to suit your company’s business processes. At this point, we’ll find out what might need fixing and whether best practices were followed by your previous partner. An important part of our assessment is interviewing stakeholders of your company. Getting active feedback from people directly affected by the implementation will help us identify what’s broken, evaluate how it affects your business and prioritize with your executive team to identify what needs to be fixed from first to last. Once we’ve assessed and prioritized your implementation, our team will recommend a course of action. These actions may include implementing various missing tools for your ERP, reworking configurations, migrating data, adding automations, and even retraining users if needed. Rest assured that each recommendation is directly suited to your company’s needs. An implementation is like a surgery – you want an expert. You can do all the research into the right ERP system for you and create a spectacular presentation to get your executive team on board. But choosing the wrong partner can ruin everything. Think of an implementation as a heart transplant. You recognized the need for it because the current state of your heart just isn’t healthy enough to support the volume of your body in day to day life. So, you go to see a doctor and they recommend the surgery. Next, you need to choose the right surgeon to perform the operation, right? You have to be very careful and look for someone with the kind of established background and standards for best practices that give you comfort in knowing your procedure is in the right hands. How GURUS Can Help GURUS happens to be one of the best ERP implementations surgeons out there, with a total of more than 14 years experience and over 2100 successful ERP implementations. We’ve been a 5-star NetSuite partner for 7 years and running. It’s not for nothing – we know what we’re doing. This may seem like a shameless plug, but when you’re looking for a successful implementation or rescue project, you want a partner that goes above and beyond by addressing your company’s specific needs. By the end of our rescue project, your business will be running smoother than ever. Don’t wait – contact us today to save your implementation gone wrong.